Better late than never post. Tomorrow we head off on Summer vacation. here is a late post about winter vacation. Oops. Back in December, around Christmas time, we had 2 weeks off of work. We’d heard good things about the Christkindl markets of Bavaria, so we thought we’d head off to Munich and swing by Prague. We read that Munich closes on Christmas day, so we decided we might as well hop on a train for Salzburg for a day trip. We arrived in Munich on the 21st. 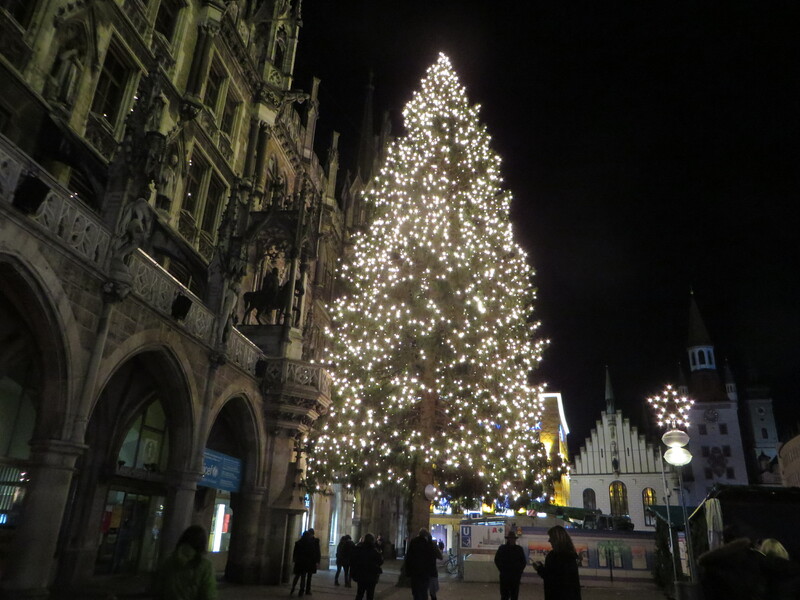 By 10 pm, we were in the Marienplatz, the symbolic heart of Old Munich and home to the Christkindl market. 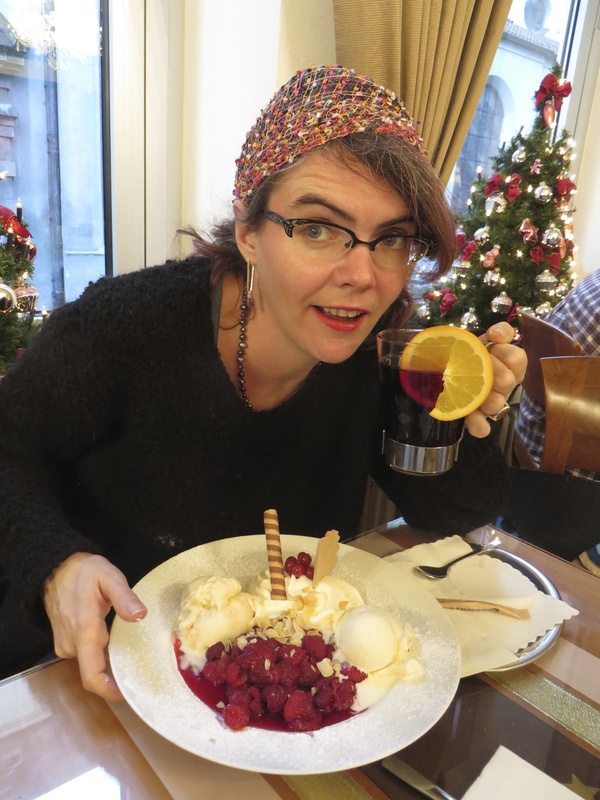 By ten of course the shops were all boarded up for the night, so instead we had some famous gluhwein (hot mulled red wine) and looked around at the huge Christmas tree. Then we discovered a nice pub and had a few beers with the locals. After months of Turkish beer, a hearty German Pilsner was just fine for both of us. The next morning we toured the markets. Everything Christmas related was crammed into dozens of market stalls that filled the plaza: nativity sets, tree decorations, smokers, ornamets, paper lanters, and candy, chocolates, and sweets. Walking through the markets with a gluhwein and a pastry, we bought gifts for people back home and for ourselves. Then we ate. Eating in Munich is a special pleasure. Pork products are hard to find, so we eagerly sought out ham, pork, and bacon. We ate at the Tegernseer Tal and the Andechser am Dom (Twice!). Mike made a vow to eat all the bratwurst in Munich, but fell a few links short. One of our favorite spots had a giant wurst and beer stand shaped like a Christmas Pyramid – one of those toys where the candle’s rising heat turns a big spinner on its tope. Then we wandered the shops and sights, even climbing to the top of St. Peter’s church tower where we had a view all the way to the Bavarian Alps. But the Munich Christkindlmarkt is not permanent. By noon on Christmas Eve, they were taking down the giant Christmas pyramid as we ate bratwurst and drank more gluhweing. Then the shops shut down, and Munich fell eerily silent. The next morning we met up with some friends and hopped on a train for Salzburg, where the markets were still open. Salzburg is famous as the home of Mozart and as the location for the events of the Sound of Music. We walked along the charming old town, had another meal of veal and potatoes (and beer! ), then explored the high castle with spectacular views. Salzburg really was a wonderland. Prague was equally spectacular. Here we stayed at a nice little AirBnB rental; we had our own little guest house tucked behind our host’s place. It was an easy walk to the bus or tram line, then into the historic old districts of this ancient capital of Bohemia. Castles, churches, intimate cafes – Prague was another fantasy land, complete with a subway, tram lines, and modern free internet everywhere. We met another friend in Prague and walked along the old town and castle for the day. The Christkindl Market here was larger and more spectacular than Munich’s. They had giant pork roasts turning over open coals, and a special pastry made by wrapping dough around a long cylinder, then turning the cylinder over hot coals, then rolling it in cinnamon sugar. There was also a lot of beer, which makes the memory of all that food hazy but also sepia toned. 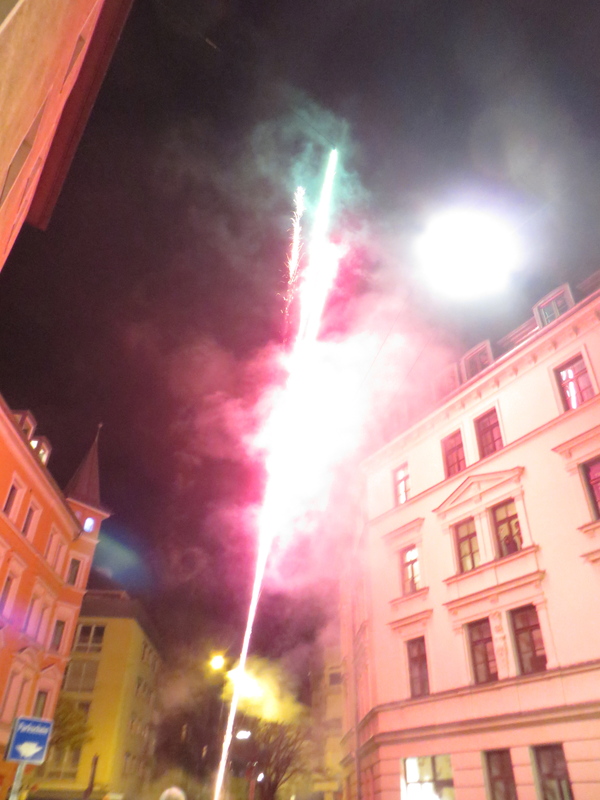 This brought us back to Munich for New Year’s eve. 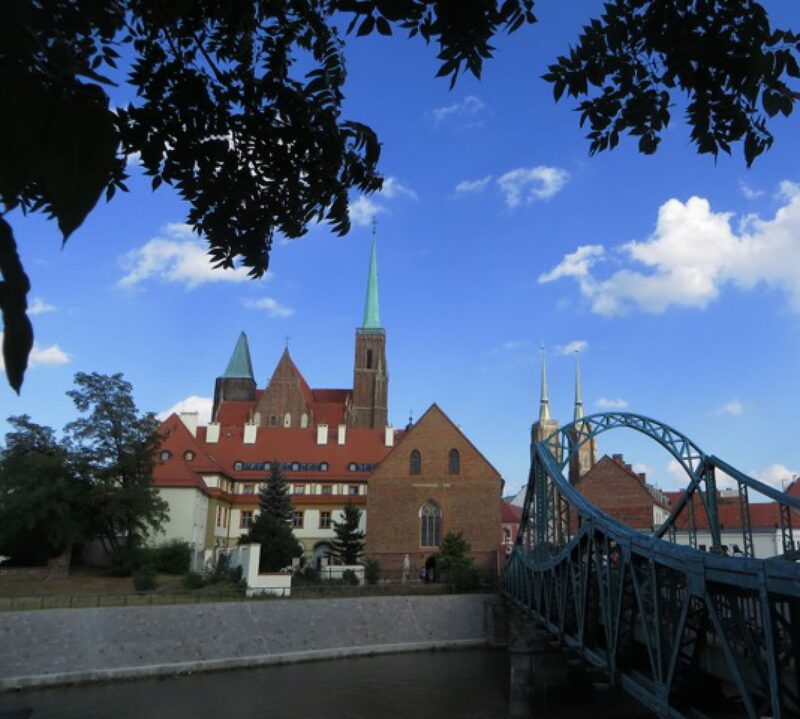 We’d heard Munich was fantastic for new year’s eve, though we didn’t know the extent of it. People buy their own fireworks and set them off in the street, for example. There aren’t any organized fireworks shows. So after finding a nice Indian restaurant near our hotel off on the west side of town, we stepped out on the street to find the entire neighborhood setting off roman candles and giant sunburst fireworks that exploded just about the roofline of the apartment houses. Smoke filled the air like fog and it was just fantastic. The next day, it was back to the airport, and home to Anakara, though we’d love to go back again. One of the best parts of teaching here is the new friends we have made. We enjoyed meeting up with them along our trip and sharing our vacation with them.